It has been suggested that this article be merged with North American prehistory. (Discuss) Proposed since September 2018. This is a timeline of in North American prehistory, from 1000 BC until European contact. For times predating 1000 BC see Archaic period (North America)#Timeline. 1000 BC: Athapaskan-speaking natives arrive in Alaska and western Canada, possibly from Siberia. 1000 BC: Pottery making widespread in the Eastern Woodlands. 1000 BC–100 AD: Adena culture takes form in the Ohio River valley, carving fine stone pipes placed with their dead in gigantic burial mounds. 500–1 BC: Basketmaker phase of early Ancestral Pueblo culture begins in the American Southwest. 300 BC: Mogollon people, possibly descended from the Cochise tradition, appear in southeast Arizona and southwest New Mexico. 200 BC–500 AD: The Hopewell tradition begins flourishing in much of the East, with copper mining centered in the Great Lakes region. 1 BC: Some central and eastern prairie peoples learned to raise crops and shape pottery from the mound builders to their east. 50 BC–800 AD: Ipiutak culture thrives in the western Arctic. 1 AD: Some central and eastern prairie peoples learned to raise crops and shape pottery from the mound builders to their east. 100–1000: Weeden Island culture flourishes in coastal Florida. They are known for their extraordinarily well-preserved wood carvings. 200: The Adena culture of the Ohio River valley evolves into the Hopewellian exchange. 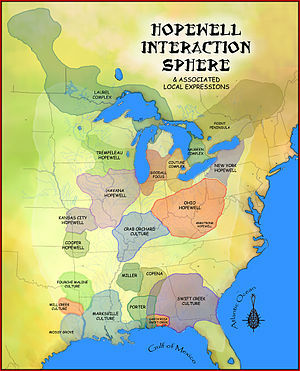 200–800: Late Eastern Woodlands cultures flourish in the Eastern North America. 400: Cultivation of maize (corn) begins in the American Southeastern Woodlands and soon reaches the Northeastern Woodlands. Originally domesticated in Mesoamerica, maize transforms the Eastern Agricultural Complex. 400: Ancestral Pueblo peoples of the American Southwest weave extraordinarily long nets for trapping small animals and make yucca fibers into large sacks and bags. 500: Late Basketmaker II Era phase of Ancestral Pueblo culture diminishes in the American Southwest. 700: Basketmaker III Era of the American Southwest evolve into the early Pueblo culture. 700–800: Ancestral Pueblo people of the American Southwest or Oasisamerica transition from pit houses to multi-story adobe and stone apartments called pueblos. 800–1500: Mississippian culture spawns powerful chiefdoms of great agricultural Moundbuilders throughout the Eastern woodlands. 875: Patayan people begin farming along the Colorado River valley in western Arizona and eastern California. 900: Ancestral Pueblo culture dominates much of the American Southwest. 900: American Southwestern tribes trade with Indigenous peoples of Mexico to obtain copper bells cast through the lost-wax technique. 915 (exact date): Construction begins at Pueblo Bonito, the largest Ancestral Pueblo Great House. 1000: Discovery of Vinland by Leif Ericson and Norse colonization of North America. 1000–1750: Fort Ancient culture, a non-Mississippian culture emerges in modern-day southern Ohio, northern Kentucky, southeastern Indiana, and western West Virginia. 1070: Great Serpent Mound built in Ohio. Scandinavians briefly settled Vinland (likely l'Anse aux Meadows on the Canadian Maritime island of Newfoundland) early in the century and perhaps ventured as far south as New England. The Thule people began absorbing the old Dorset culture in Arctic Alaska. 1142: League of the Iroquois is founded, and the Great Law of Peace is adopted by the Mohawk, Seneca, Cayuga, Onondaga, and Oneida people. Wampum invented by Ayenwatha, which the Haudenosaunee used to record information. The Inuit Thule people largely displaced the old Dorset culture in Arctic Alaska. The most important city of the Mississippian culture of mound builders, Cahokia on the Mississippi River opposite modern Saint Louis, Missouri, reached its zenith. It was the largest city in North America in the 12th century. 1200: Construction begins on the Grand Village of the Natchez near Natchez, Mississippi. This ceremonial center for the Natchez people is occupied and built upon until the early 17th century. The Inuit Thule people have completely displaced the old Dorset culture in Arctic Alaska. Pueblo people in the American Southwest evacuate most above-ground pueblos to build spectacular cliff dwellings housing hundreds of people. The dominant Ancestral Pueblo begin gradually absorbing the Mongollon culture in the American Southwest. Athapaskan-speaking people begin migrating from the prairies of Alberta and Montana toward the American Southwest. The Four Corners area of the American Southwest suffered severe droughts late in the century, causing many Pueblos to abandon their cliff dwellings for irrigable settlements along the Rio Grande in southern New Mexico. 1300: Cliff Palace is abandoned. 1315–1317: The Little Brown Ice Age brought a period of severe decline to medieval Europe, causing the Great Famine. The 14th century in America probably also brought decline of the Mississippian culture, especially in the northern states. Dendroclimatology suggests that severe droughts ravaged the American Southwest and especially the Southern Plains early in the period, leading to a rapid cultural decline. Athapaskan-speaking people continue to migrate southward from the Canadian prairies toward the American Southwest. Athapaskan-speaking Apache and Navajo reach the American Southwest after migrating over three centuries from the western Canadian prairies. 1497: Italian navigator John Cabot sails from England to Newfoundland (first European contact on the American continent since the Norse colonization of North America 500 years earlier. ^ a b Barry Gwin Williams, "Cultural Resources Overview: Lake Andes National Wildlife Refuge—Southeast South Dakota," US Fish and Wildlife Service: Region 6—Cultural Resource Program (Jan. 2012), DOC. ^ Ancient Citadel. Smithsonian Magazine. April 2008. ^ Casey, Robert L. Journey to the High Southwest. Guilford, Connecticut: Globe Pequot Press, 2007: 382. ISBN 978-0-7627-4064-2. ^ Speakman, Robert J.; Neff, Hector (2005). Laser Ablation ICP-MS in Archaeological Research. UNM Press. p. 170. ISBN 9780826332547. ^ Professor, Dean R. Snow (2015). Archaeology of Native North America. Routledge. p. 201. ISBN 9781317350064. ^ Adler, Michael A. (2000). The Prehistoric Pueblo World, A.D. 1150-1350. University of Arizona Press. ISBN 9780816520480. ^ "Thule culture - prehistoric culture". Encyclopedia Britannica. Retrieved 4 March 2018. ^ "Dorset culture - archaeology". Encyclopedia Britannica. Retrieved 4 March 2018. ^ "New Evidence May Solve Mystery of America's Huge Ancient City". National Geographic. 19 May 2015. Retrieved 4 March 2018. ^ Turney, Chris (2008). Ice, Mud & Blood: Lessons of Climates Past.